Chronic Overtraining Syndrome, an athlete’s equivalent of Chronic Fatigue, is quite a common occurrence amongst endurance athletes due to the nature of endurance sport and the training required. To explain simply, training places a stressor onto the body by putting the body into an altered state. The body then responds to this in the form of training adaptations, so it can better handle the stressor or conditions in the future. As endurance athletes we push our bodies well beyond their comfort zones in order to optimize these physical adaptations and as such, often tend to push that a little too much, also known as over-reaching. Over-reaching on the odd occasion isn’t going to cause much damage – other than perhaps being more susceptible to a cold or feeling flat for a couple of weeks. It is when we constantly over-reach and not allow adequate recovery that can lead to Chronic Over Training Syndrome. Although this seems to be the most obvious, it is often the most difficult to recognise as it is a symptom of life that we all experience on a daily basis. Identifying what is just general training fatigue versus chronic and ongoing tiredness is essential to recognising Chronic Overtraining Syndrome, particularly in the early stages. For me, it was a battle to identify, as I was extremely motivated and surrounded by people who fundamentally believed that pushing harder would make you better. This was a mindset that I soon discovered to be hindering and limiting my performance significantly. It took a number of other symptoms to arise before I began to even consider that something wasn’t right in terms of my health and energy levels. Sleep patterns with Chronic Overtraining and Chronic Fatigue patients seem to differ a little, however, there are a few similarities in terms of these symptoms. Sleeping longer and wanting to nap is one of the first things I experienced. I wanted to sleep more often and for longer periods. I found myself yawning in most of my sessions and falling asleep in classes at Uni. At the worst of my illness, I would sleep 10 hours a night and 2 to 3 hours during the day. The most interesting symptom however, was that I was struggling to fall asleep. Previously I had always been able to hit the pillow as soon as the lights went out, but once I had chronic overtraining this changed significantly. I would be tired but not be able to fall asleep. For the first time in my life I began to struggle to sleep. I would toss and turn and have a restless sleep even though my body was suffering from chronic tiredness and Chronic Fatigue. Inevitably the occasional cold became my monthly cycle along with a constant lingering sore throat. This would always present itself during the most inconvenient and important times. 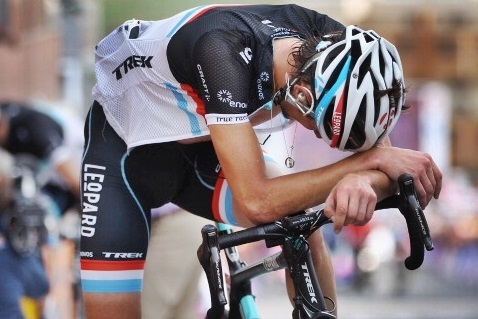 Whether it was exams, a race or a good block of training, I’d begin to get sick. When you think about it, it’s not surprising, as the body is already under such stress, anything that adds to that just pushes it over the edge. These can occur in multiple ways and are again a clear visible sign of the stress your body is under. Skin conditions can occur in the form of rashes or psoriasis, cold sores, and even warts as these all occur when the body’s immune system is run down. Muscle fatigue is common amongst athletes and is again an obvious and normal product of training. However, muscle fatigue in an overtrained athlete is much more severe. Muscles become so fatigued that even the smallest of unusual moments or activities will make your body ache in a ways that would usually only occur from doing some of the hardest sessions you have in your program. As with the body, the mind responds to stress in a very similar way. Irritability is heightened since the body is under stress. I am sure we all can admit that most of us will become irritable when tired and stressed. When overtrained, this becomes an everlasting feeling that doesn’t subside once the assignment has been submitted, the exam passed or the major race completed. It lingers and leaves a destructive trail in its wake. Depression doesn’t always present itself in the form of ‘feeling sad’ or ‘depressed’. I believe depression to be on a continuum and no matter how severe, it can create an unhealthy and unhappy environment for someone to live within. For myself, I certainly didn’t feel depressed or sad, I just felt an overwhelming feeling of dissatisfaction with where I was at, what I was achieving and questioning what I was doing. The essential thing to understand about Chronic Overtraining Syndrome and Chronic Fatigue, is that it is never just one factor at the root cause of the issue. Everything we do has a stress impact on our bodies. Don’t underestimate the collaborative stress of the multiple tasks you perform in one day in addition to your training – study, work, travel, relationships, daily living tasks (shopping, cleaning, cooking, washing) etc. Chronic Overtraining Syndrome and Chronic Fatigue is not something to be worried about but should always be considered and avoided if you want to achieve your optimal performance. The myth of ‘If I train harder, I’ll get better’ is a thing of the past. We have far too much information these days to be so ignorant as to approach training in this way. Yes we must train hard, but more importantly we must train smart! 90 Greg Scruggs Jersey.Buy Cheap Jerseys For Women china for authentic, wholesale football stitched 48 Patrick Scales Jersey here to get free shipping. 45 Rod Smith Jersey factory, you will get free gift at this store also with top quality.